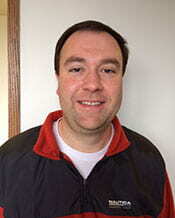 Sean started on March 21, 2014, as Head Coach for Women’s Volleyball. Prior to starting at UW-Green Bay he was the Assistant Coach at the University of Mississippi for three years. He earned his degree at Ohio Dominican University in Visual Communications. His home town is Silver Spring, Maryland. We’d like to welcome Sean, his wife Jacqueline and their three daughters, Brinley, Carlyn and Chase to UW-Green Bay.